Life in the fast lane - in a slow car...: "Goin' to the chapel and we're gonna get married..."
"Goin' to the chapel and we're gonna get married..."
Where does one begin when the last post was last YEAR? I guess randomly. So here goes! 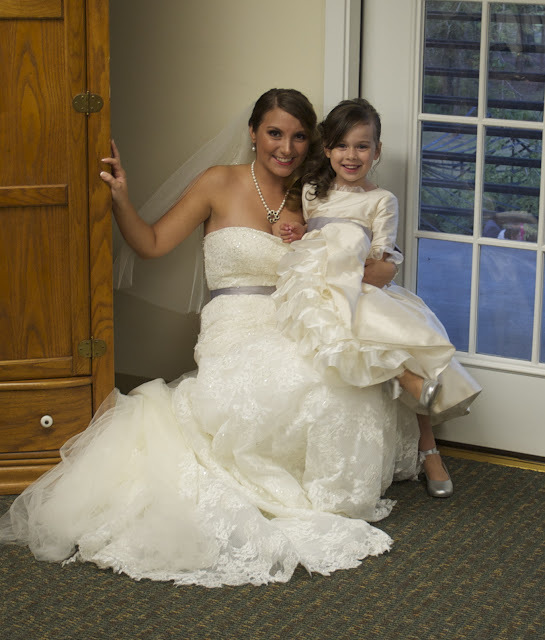 This past weekend was the wedding of a dear friend of ours (and Mirai's "nanny"), Amanda, to her best friend, Manny. And Mirai was the Flower Girl. 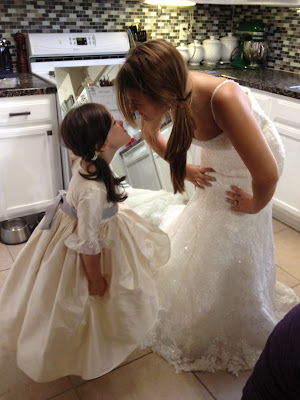 Last January, after a fairy tale proposal - literally, a fairy tale proposal in front of Cinderella's Castle at Walt Disney World, Amanda asked Mirai to be her flower girl. I'm not sure Mirai really grasped the concept of what that meant - she just knew it was something special, that Amanda wanted her and she was content. A dress style was selected almost immediately - a Marie Antoinette style dress. It would have to be made - the only one "ready-made" was from an outfit in the UK. Between shipping costs, the possibility of it not fitting and returns added to the very real fact that Mirai is a GROWING girl, it was decided that the dress would need to be made. Tonya Mayberry, fellow Christian, good friend, and excellent seamstress was asked to make the dress. About a month ago, I went shopping with Julie (Amanda's mom - also fellow Christian and good friend - don't know about the "excellent seamstress" moniker however -ha!) to get the beautiful Dupioni silk in ivory that would be the main fabric of the dress. And, sure enough, the measurements taken at the beginning of summer were vastly different from the taller and more rounded Mirai of late August. I scoured the internet for just the right shoes finding lovely kid leather ballet slipper flats (with ribbon ties no less!) in a soft silver grey. 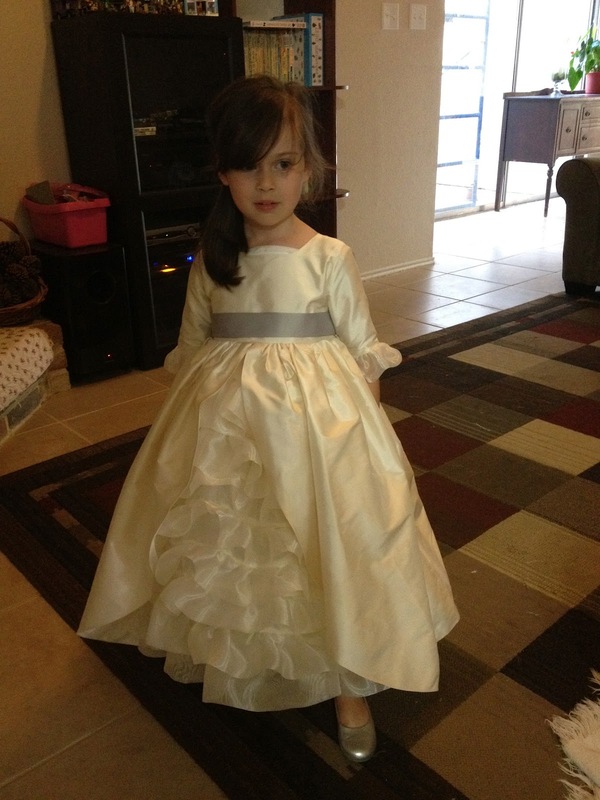 The first fitting was almost better than the Bibbity Bobbity Boutique at Disney when the "reveal" happened. Julie, Amanda and I were just wowed by this dress! I think Mirai thought it was a real princess dress although I could hear in my head what would come when it was being fitted ("It's scratchy!"). 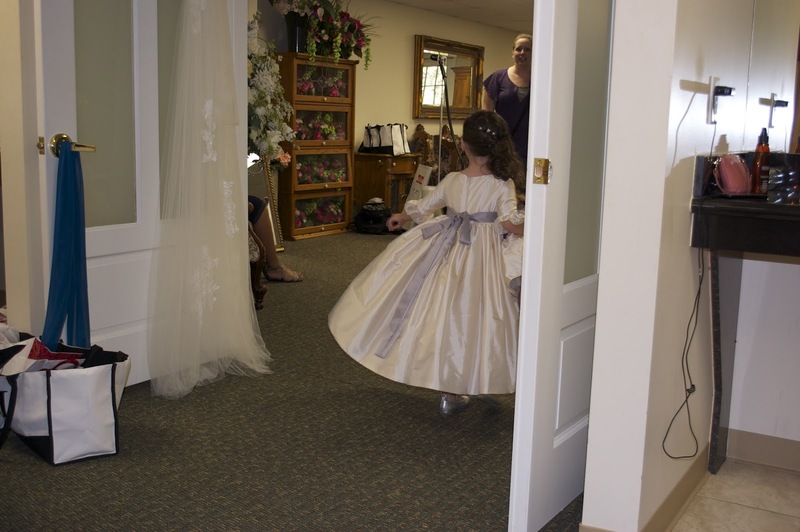 The dress fitting itself was great fun mainly because Amanda was getting her wedding gown fitted as well! Those two girls are peas-in-a-pod! A few adjustments were needed and we left the dress with Tonya. The shoes were a perfect compliment and we left. 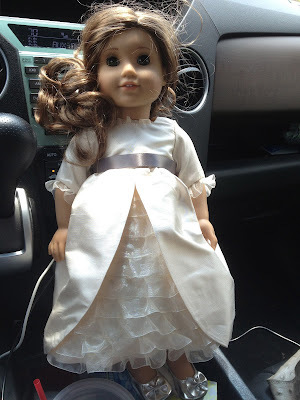 Unbeknownst to Mirai, I'd commissioned a "mini-me" dress for her American Girl doll. When I went to pick up Mirai's dress the next week, the doll dress was finished as well. How adorable was THAT?? 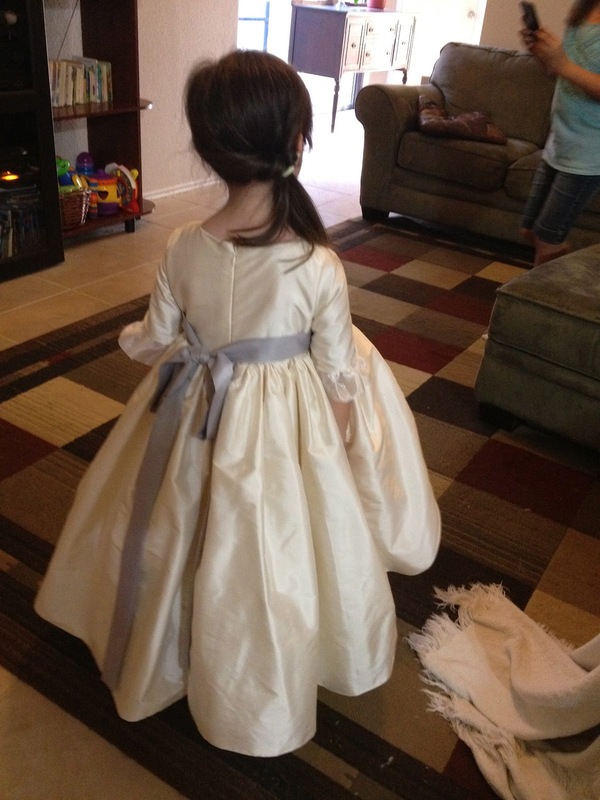 We didn't give her the doll dress until the day of the wedding, which was last Friday. She loved it! 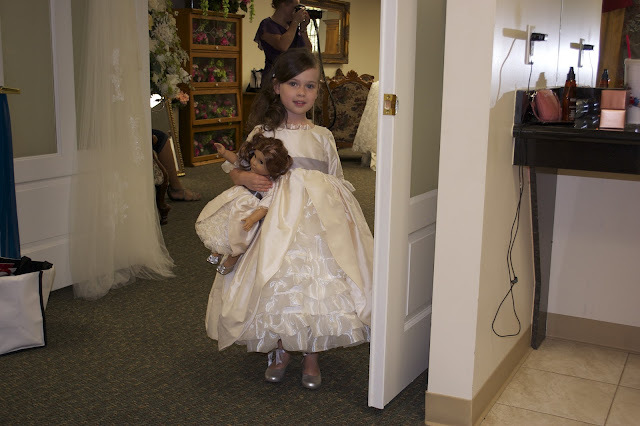 I did caution her that the doll could NOT go down the aisle with her at the wedding which was a good thing - because that doll was a constant companion the REST of the time! We headed to the wedding venue arriving mid-afternoon. 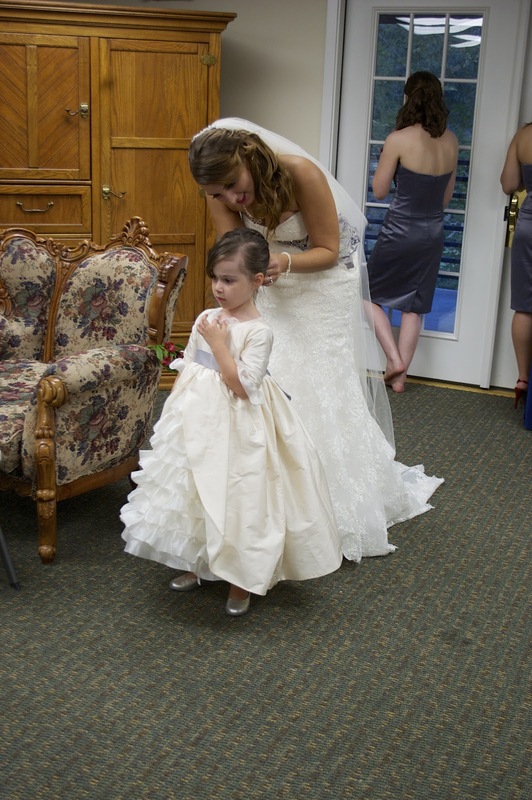 After her hair was done, it was almost time for the formal photos before the wedding. I wasn't there for those but heard that her doll was in many of them - oh dear, sorry about that, Amanda! Amanda's bridal attendants were so caring of Mirai, watching out for her, giving instruction when needed and reining her in as well. All-in-all, I think Mirai behaved very well for a five year old "in the spotlight". Let's just say we had some preconceived concerns that never came to fruition. 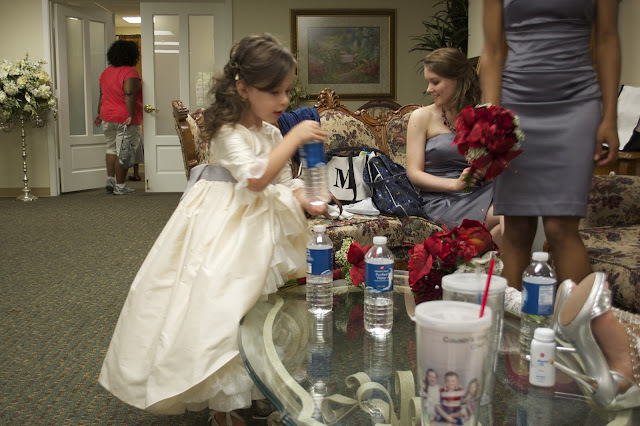 This may well be my favorite photo from the time up in the Bride's Salon before the wedding. My "two girls", both excited and anticipatory, albeit for different reasons, but still so animated and happy! Some final hair adjustments by Amanda before heading down. I'm sure there will be more photos later but these are the ones I took. It was such an honor to be involved in this wedding in so many ways, to feel included in family and to share the joy and happiness of this great day! Congratulations to Amanda and Manny - may your years be long, your disagreements few, your friendship always growing and your love always deepening. Praise God from whom ALL blessings flow!